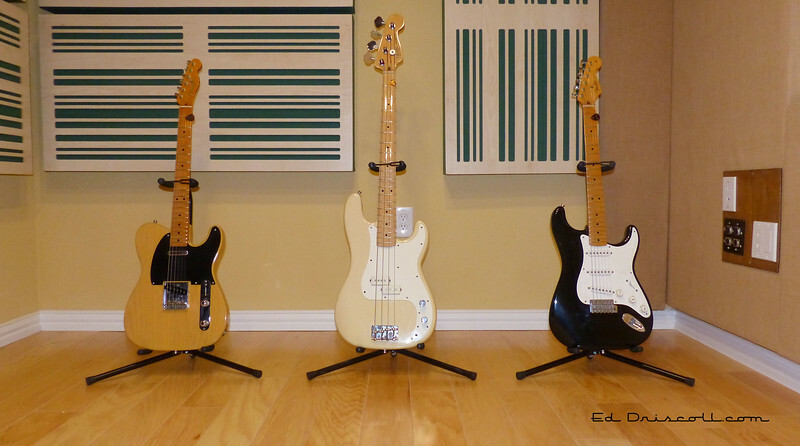 From left to right, my 1984 Fender '52 reissue Telecaster, 1983 Precision Bass, and 1984 '57 reissue Stratocaster. 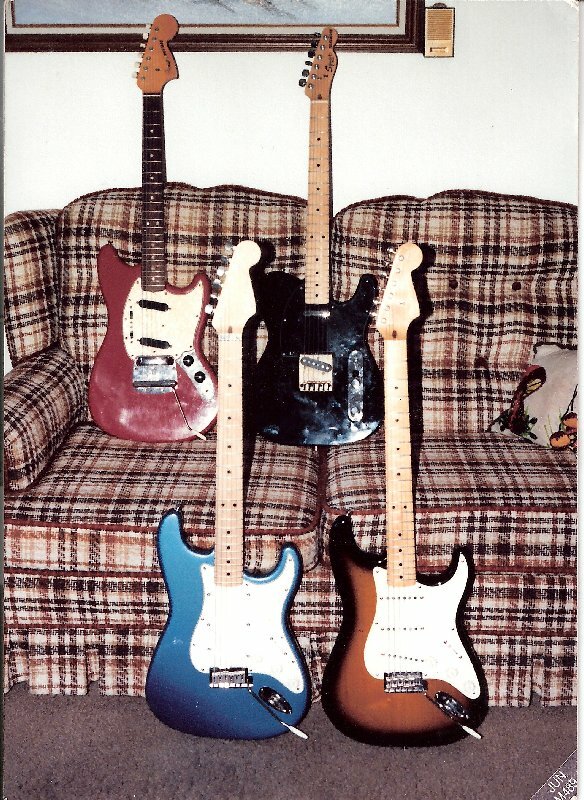 The Strat and Tele were featured in my November 2004 Vintage Guitar article on Fender's first reissues. 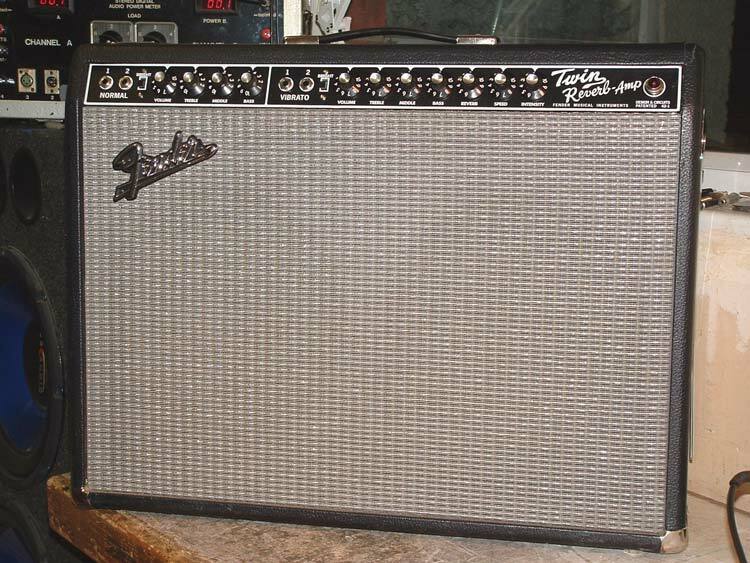 Got an '80s Fender? Show 'em off here! 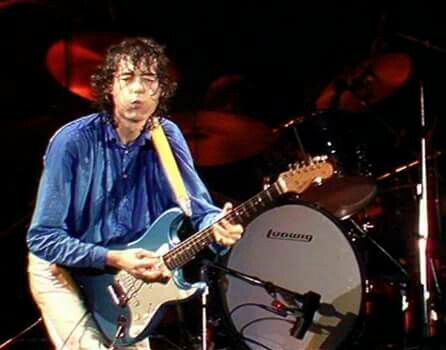 Here's another early 80's Fender model that is a great instrument and often overlooked, the THE STRAT's. This model has been owned and used by Clapton, Page, Knopfler, and the Edge but remains somewhat obscure. They are probably the most versatile Stratocaster ever made ! Last edited by MightyMouse; 03-20-18 at 04:23 PM. I remember the Strat, with its painted headstock. I don't know if he played it on stage, but I believe Page had his at the London ARMS concert to benefit Ronnie Lane. Fender built that near the end of the CBS era, right? They were made 1980, 1981, and 1982. The 1981-82 STRAT's feature much higher quality materials, and craftsmanship than the*mass-produced 1980 Fender STRAT model. 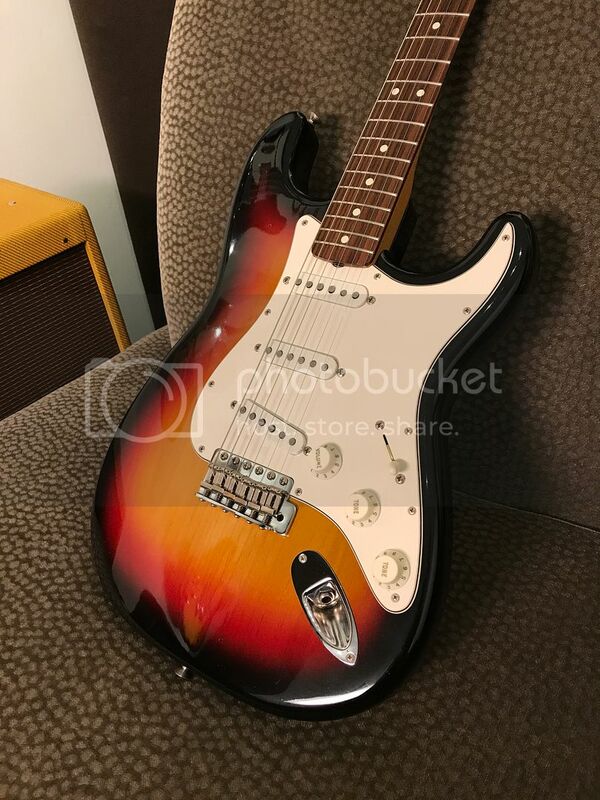 The 1980 models were built before arrival of Bill Schultz who shut down mass production assembly lines and returned to quality instead of quantity methods and subsequently the 1980 models are far inferior to the later version 1981-82 STRAT models ! The later version of STRAT can be identified by the presence of the gold tuners and switch tip which the 1980 version is missing. The later models also feature a GO prefix serial number instead of the E0 (for Eighty) prefix from 1980. Last edited by MightyMouse; 03-20-18 at 07:06 PM. Those look brand new, too shiny, put it back in the case, my eyes!!!! 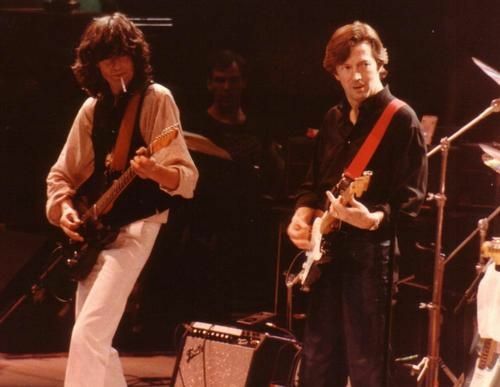 I don't recall seeing Page playing a Strat at the RAH on the ARMS show. I believe it was a '64 in Lake Placid blue with an unpainted headstock. If memory serves, he got in in 1975 and used it in the studio on Presence. I got one of the first "'52" Tele reissues. After a relic job on the fingerboard and a body swap with a '68 plus Seymour Duncan's finest, it was much better. Yeah, I just recall reading an article in Guitar World, Guitar Player, or Musician listing Page's guitars backstage at the ARMS show and mentioning the Strat, in addition to the Lake Placid Blue Stratocaster he used at Knebworth. I replaced the neck pickup on my 52RI Tele with a Seymour Duncan Broadcaster pickup IIRC. The original was pretty microphonic. In hindsight, the Fender reissues were garbage. I discovered Japanese reissues and Bill Nash, and got rid of everything else. I'd have given it away, too. In hindsight, the Fender reissues were garbage. Hey, way to encourage a guy to post photos of his guitars! I quite liked the Strat reissue -- it was my first Strat, I played the hell out of it, and I thought the build quality was quite good. The Telecaster, I had some buyer's remorse after purchasing it: it's heavy and the original neck pickup was microphonic. Back in my band days, I relegated it to open-G Stones songs. In 2003, I had it refretted with bigger frets, and had the bridge replaced with an old three-saddle bridge, and it's much more playable. But it's obvious that the out of the box build quality of my '98 Nashville Tele was much better. I have kept my 1982 '57 Reissue. Very nice guitar all in all. I've played some pretty nice Japanese and Nashes as well. I try to judge each guitar on it's own merits. Are you the one playing in the you tube video ? If so , mighty nice chops and your tone is to die for thru a Fender ? Wow , how did you get such a tone ? My compliments on your chops and tone ! Wow, did those have a nitro finish? The wear looks almost like on a 60ies Strat. It's great to see this thread come back to life -- that '62RI looks terrific! I love these guitars, they have a nice, thin Nitro finish. This is my 1986 '62 AVRI. It has a two piece body and plays great. I really like the thin necks these have and even though I'm 6' 3" I find them very easy to play. My first good electric guitar was a 1987 '62 AVRI in Fiesta Red that I bought new and still own. It is so much better than the Bullet truss rod Stratocaster that it replaced. I just bought a 1985 '57 AVRI that I'm fixing up right now. The pickups in these guitars sound very good. The arm contour is very distinctive and IMHO, just right. I know pro players like Sonny Landreth like these 80's AVRI Stratocasters for touring guitars. They are one of the best deals in a vintage, collectible Fender. Absolutely top notch guitars. If it ain't vintage....easy peasy..make it vintage the old fashioned way! My folks didn't drive me to gigs. Unfortunately, I didn't keep my mid '80s AVRI '57 Strat long enough to see it age. I don't recall what year it was made. I bought it "new" in 1986 but it had hung on the shop's wall for a long time. I never got along with the small frets on a glossy fretboard. I replaced it with the new Strat Plus that's in the pic. I bought that guitar in late '88. The Mustang was a '66 and the Tele was a Squier that I bought new in '85. This pic was taken in early '89. I don't have any of these guitars now. At least you had the foresight to take pictures. I've owned a bunch of Strats over the years, but didn't get an AVRI until later in the game, late '99. All around nicely built guitar and one of the few Strat's I owned that didn't need a fret file right off the bat, but I hated the V neck. Also, it (ash body/maple board) had that "plinky" tone some Strat's have that I find really annoying. This is my mid 80s Tele 62B Mij, I can't think of a better guitar that I've played. Those 80's MIJ Fenders are fantastic guitars. A few years ago I borrowed a Tele from a friend and I had never even played an MIJ Fender before. I eventually had to give it back and proceeded to go out and buy one! They didn't cost much more than a MIM guitar and, other than the wiring, are superior in every way. Good luck in getting one now - the cat is out of the bag and they are really hard to find!! "Know tubes, know tone. No tubes, no tone"
So you are saying this one is actually naturally reliced like that? It only had a tiny bit of wear on the upper bought when I got it. Everything else happened while I had it out on tour.